Q: Can you tell us a little bit about your career so far? What college did you attend? What did you study? A: I attended the Chicago College of Performing Arts at Roosevelt University for my bachelor's in music performance, MMED Vandercook after that. I was a jazz performance major (upright bass) for my bachelor's. We basically played all day; it was amazing. For my master's degree, I studied all things music, attaining K-12 certification in Band, Chorus and Orchestra. I recently quit bartending after 12 years and was a full-time carpenter for the six years between my degrees. The reason I mention that is because it taught me the discipline and patience I needed to become a teacher. A: Why teaching? I've always had a chip on my shoulder; I remember as a performance major in college, the education major students were often scoffed at...the famous Woody Allen quote (those who can...do, those who can't...teach...those who can't teach...teach gym). I always thought that was elitist, because my mom was a teacher for 20 years. CPS wasn't my "second choice"; I got my master's on the south side and immediately felt a connection to the system. Q: What classes do you teach at Amundsen? 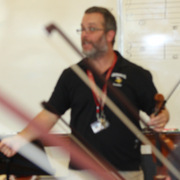 A: I teach beginning orchestra, IB orchestra and advanced orchestra. Literally on my feet all day. A: I run a service learning project that mentors students at Chappell Elementary every Wednesday. My advanced players become "Viking Buddies" with Chappell students and help them. The program is called the Amundsen String Ambassadors. This year I sponsored (and won) a grant via CPS Ingenuity and the Negaunee Music Institute of the Chicago Symphony Orchestra. The grant purchased over $10,000 in instruments for Chappell and enabled them to begin a full-time orchestra for all 4th graders. My goal is to utilize community high schools as a neighborhood "beacon" in order to replicate similar programs throughout the system. This replicates the suburban model, where access to a quality and complete music education begins at the 4th grade. For me that entails a robust, full-time offering of Band, Orchestra and Chorus. Recent highlights: Starting a permanent orchestra is one of my proudest accomplishments ever. The grant also brought the CSO to perform at Amundsen last week and Civic Orchestra members (10 of them) will be mentoring our advanced players for a co-concert (Amundsen, Chappell and Civic Orchestra) on May 30. A: Most of my students come to me with very little formal music training. We start from the very beginning. Q: What do you like best about teaching at Amundsen? A: It's very challenging, the kids keep me young, my co-workers are amazing. I really feel like I'm making a difference in the lives of these kids....my job really has nothing to do with music actually. Q: What are Amundsen's greatest strengths? A: Amundsen's greatest strength: Our diversity...the chip on our shoulder. Q: Can you describe one particularly great moment you've had as a teacher at Amundsen? Q: What advice would you give to students just choosing Amundsen? How can they get the most out of their high school years there? A: Take advantage of all the collaborations, clubs and sports offered; this staff works very hard to provide incredible opportunities and experiences for students.